I noticed a few drops of something on the street the other day while airing up my tires. Should've paid more attention. That evening I was parked at a friend's house and, on backing up to clear his car a horrible noise started. Sort of a growling sound. I'd been backing up up-hill and my motor mounts aren't the best so things tend to shake quite a bit. I figured, crap I've damaged something in the drive-train. But no—the sound happened moving or not, in neutral or in gear. Oh well, it was late, I made it home, I'd look at it in the morning. Next morning I see all of my power steering fluid is on the ground beneath the jeep. Nothing in the pump reservoir. What I was hearing was the pump complaining as it lost fluid. I made it home without noticing any loss of power steering so the rest must've drained overnight. 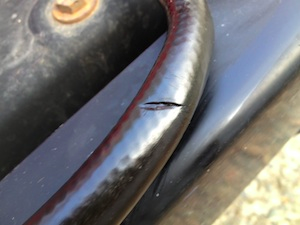 A bit of poking around revealed that the low pressure return hose seemed to be pinched between the frame and the grill. Further, I could see fluid coming out of the low pressure line when my wife turned the wheels lock-to-lock a few times. So, out came the radiator and off came the grill. Or, at least, shoved back came the grill (since I was too lazy to disconnect the lighting wires). 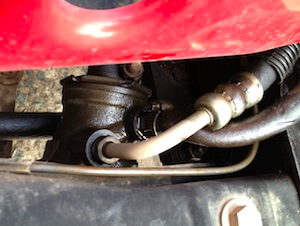 With the grill pushed out of the way access to the steering box and the hose attachments is *much* easier. I can't imagine trying to do this without moving the grill (or pulling it completely which would be even better). Fortunately, the grill is held in place by three bolts to each fender, one at the bottom through the frame cross-member, and the two rods tying it to the firewall. Mine took about ten minutes to detach. You can see the top of the steering box and the two hoses here. 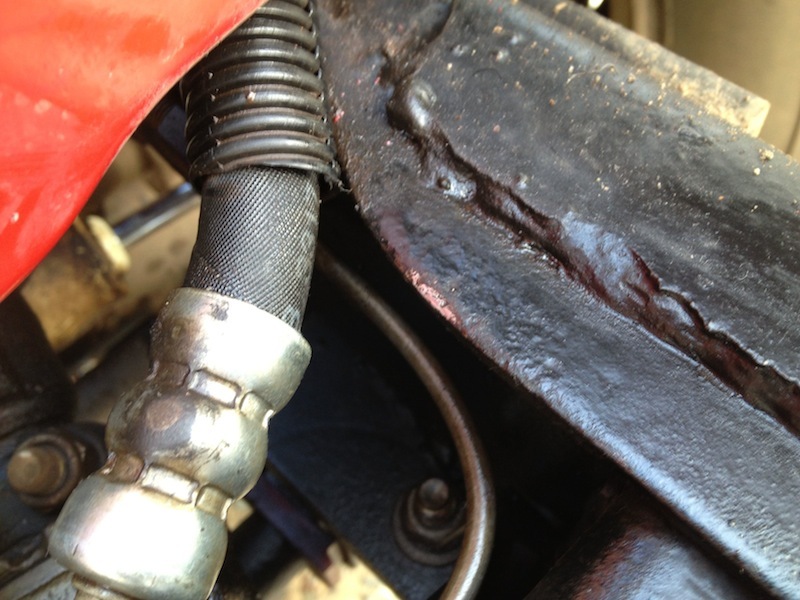 Fluid was leaking from the low-pressure hose which is the one without the angled metal tubing. I was assuming the leak was due to being pinched between the grill and frame but I couldn't yet see that directly. 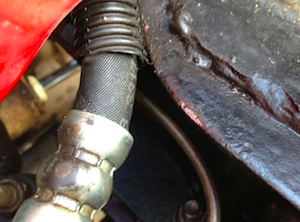 So I loosened the hose clamp and pulled the hose off the steering box. Yup! That was the culprit. Constant rubbing against the frame had cut right through the hose. Flexing it really opened up the cut and I could see inside the hose. Whoever installed the power steering (it was added on by a previous owner, didn't come from the factory with it) didn't do a very good job of routing the hoses—or at least protecting them. Here, if you look closely (or click on the image to see a larger version) you can see the spot on the frame that has worn down to bare metal while rubbing against the hose. It basically acted as a dull knife, slowly slicing into the hose. So off to my local Napa I went to buy a replacement for about $10. When installing the new hose I made sure to wrap some protection around the area that might come in contact with the grill or frame in future. The rest was easy. 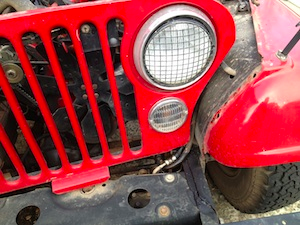 Reassembly went quickly—with a bit of jiggling and shoving to get the grill and fenders to line up just right. Tip: don't tighten the various bolts until all are in place so you have some wiggle room in adjusting things. Once it all looks good, then tighten 'em all. 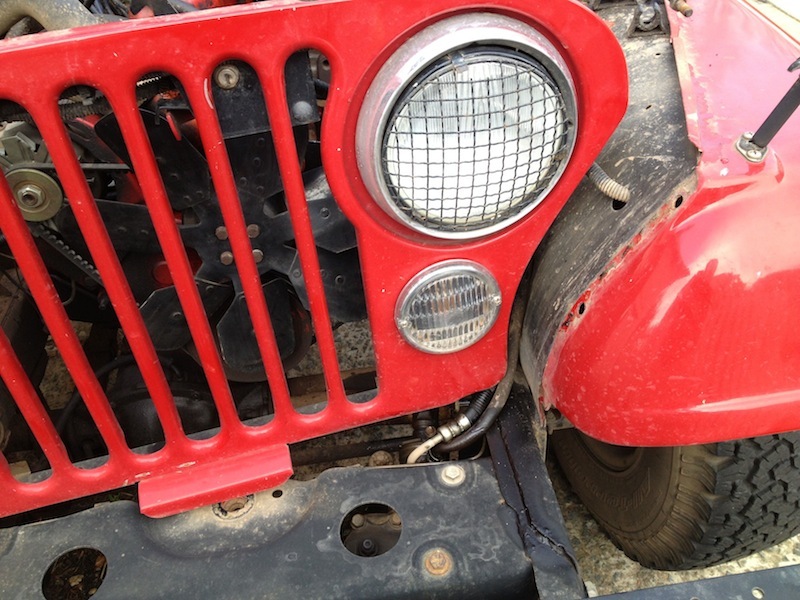 As others on the Jeep Forum have noticed, it is such a tight fit between the bottom of the grill and the high-pressure hose fitting that some effort must be spent to get everything tucked in. Some resort to slightly bending the metal tubing. I found I could get it in without doing that, but just barely. I dropped the radiator back in, topped up the cooling system, topped up the power steering fluid reservoir and fired it up. 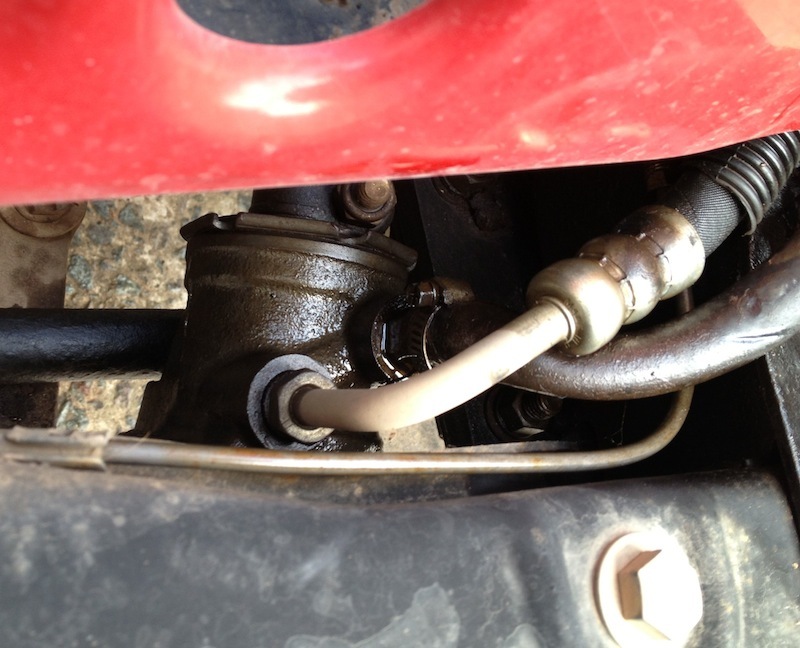 After warming up for a bit the steering fluid level had already dropped as the new fluid circulated through the hoses. So I topped it up again and worked the wheels back and forth a few times to ensure the level was correct and any air in the lines was worked out. Then I buttoned it all up and went for a test drive. Total time it took me: about three hours.